Custom printed Labels and Stickers are the industry’s most popular and cost effective way to package, promote and brand your products. Gator Paper’s custom printed Labels and Stickers are affordable, visually stunning, and completely customizable. We offer a wide range of papers, substrates, foils and films to help meet your custom design goals. We also offer finishing techniques that include Cast & Cure™, cold foil, matte finishes, and clear film for a no-label look. 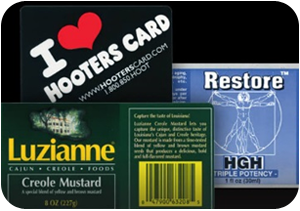 Our high quality custom printed personalized stickers and print labels are an excellent choice for almost any industry, including retail merchandise, food & beverage, event marketing and more! Low minimums and quick turnaround times! 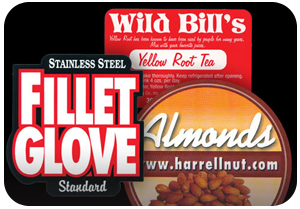 Our Custom Printed Labels and Stickers deliver in both visual appeal and superior performance! How many Label stickers do I need to buy for a custom print? The minimum order requirement for most custom printed Label and Sticker sizes is 1,000 pieces. Smaller order sizes mean less need for additional storage. What is the lead time for custom sticker printing? Standard lead time for all custom printed Label and Sticker orders is 2 weeks. Rush orders are available for an additional fee when the production schedule allows. Transit time is typically 2-4 days for the East coast, and 5-7 days for the West coast. What are your custom stickers printing capabilities? 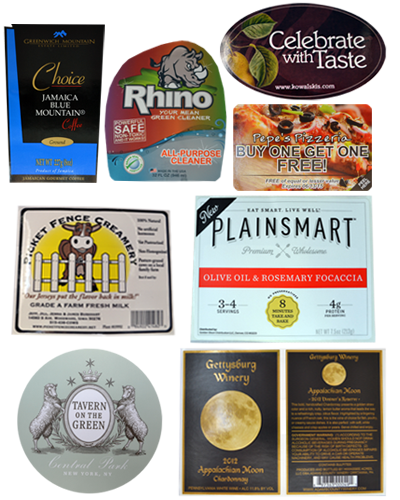 Ten color in-line print capabilities with a wide variety of papers, substrates, foils and films to help bring your custom Label and Sticker project to life! These stunning high quality labels are sure to impress! What kind of artwork is required label and sticker design? Vector art files are preferred. Adobe Illustrator, .EPS and high resolution PDF files work the best. If the line artwork is simple enough, sometimes a JPEG file will work. Bitmap images are not good enough quality for proof or plate making, and are not accepted. Need a price quote on custom printed Labels and Stickers? Contact us today! Looking to take your food service presentation to the next level? Check out our line of custom printed Deli Paper.